BioClad, a specialist manufacturer, supplier and installer of hygienic cladding technology has clinched a trio of high-profile contracts worth over £3m after scooping a Queen’s Award for Enterprise. Hinkley Point C nuclear power station commissioned the Harrogate-based antimicrobial specialist in a £1.75m contract to install over 45,000 sq. m of wall linings – the biggest installation of its kind – in its staff accommodation villages. The second milestone sees global chemical manufacturer BASF naming BioClad as its exclusive partner and offering BioClad’s antimicrobial wall cladding and associated products to pharmaceutical, healthcare and leisure clients across Saudi Arabia, Oman, Turkey and UAE. Blazing an export trail in principal markets spanning Australia, Canada, Europe, India, Saudi Arabia, UAE and Mexico, BioClad has also opened an Australian subsidiary in Perth. Global sales account for 25 per cent of its £10 million turnover which has increased by 15 per cent over the last year. Ambitious targets are now being set for 2018. 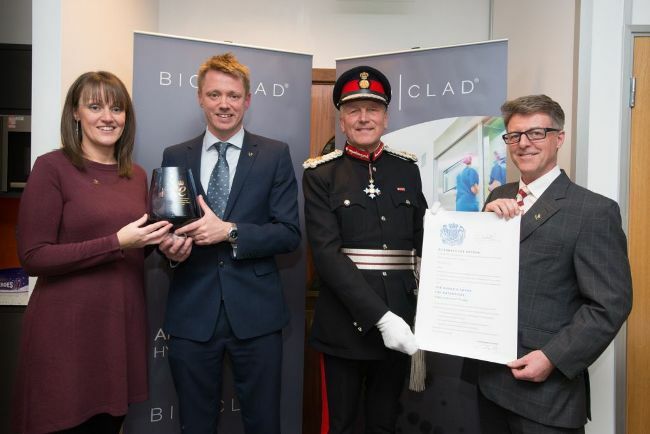 BioClad is the first company in its sector to achieve a Queen’s Award in International Trade. Its export sales director, Andy Newbould, was presented with a glass bowl and scroll by Her Majesty’s representative for North Yorkshire, York and Teeside, the Lord Lieutenant of North Yorkshire, Barry Dodd CBE, at a ceremony at the company’s Cardale Park offices.